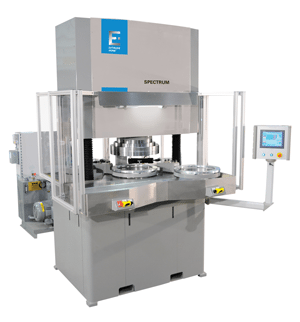 The SPECTRUM Series abrasive fl ow machine offers a broad range of process capabilities with a selection of media cylinder diameters ranging from full pressure 12” (300mm) models, to lower pressure 24” (600mm) versions. For maximum process control. State-of-the-art control system stores and monitors all major process data. Controlling the temperature of the abrasive media gives a more consistent machining rate. Various options create a tailor-made system. Generously dimensioned work envelope for large workpieces and rapid tool change. Touch screen interface for easy operation and setup. Enables to save multiple processing parameters as required for ease of use and quick recall in the manufacture of multiple customer parts.